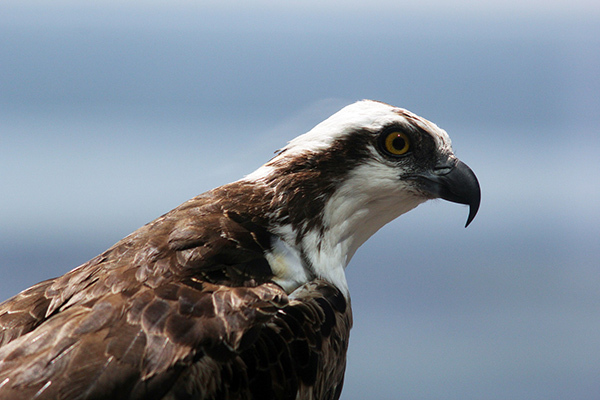 An osprey is a very large, distinctively shaped hawk. Its head is white with a broad, brown stripe through the eye. Despite its size, it has a slender body. Ospreys are unique among North American raptors for their diet of live fish and their diving expertise. Now a common sight circling over shorelines, patrolling waterways or standing on their huge, stick nests built in the forks of trees, on rocky outcrops or on artificial platforms, ospreys have rebounded since the United States banned the pesticide DDT in 1973. Ospreys search for fish by soaring high over shallow water. An osprey in hunting mode is a model of concentration, plunging into the water with feet outstretched and yellow eyes sighting straight along its talons. Often, you can clearly see an osprey’s catch held fast in its grip as the raptor carries it back to a nest or perch. Watch the three sequences taken of a hunting osprey below. In the first, an osprey gathers five to six fish during a single sweep. In the second, one of the birds grabs a flounder that was submerged in at least three feet of water; and in the third, an osprey makes off with what some say looks like a five-pound steelhead—grasped and carried for a time in only one talon! See ospreys and other large birds of prey in the wild on one of our Yellowstone National Park adventure trips. Have watched this so many times, and each time I am THRILLED. To watch his wings…… amazing….. and the strength in the last one. Wonderful video of a great subject. I like the simultaneous multiple angle shots!! Fantastic footage – we got a live show this weekend at Northern New Mexico’s Morphy Lake state park – which is a small 30 acre lake at 8000 feet surrounded by native Ponderosa pines – with the small lake you got to observe the Osprey’s entire hunt and 5 successive trys before getting her Lake Trout to take home…what a bird! For everyone to whom this seems to be “rare video” or even at all unusual, I urge you to visit the Chesapeake Bay and its tributary rivers (such as the James, Potomac, or Susquehanna) or the Outer Banks of North Carolina. We have osprey in abundance here, and observing their fishing is so common that it’s not an extraordinary event. Just great! I love watching these powerful birds. No wonder they are called Fish Hawks! Great, superb! : I have had the opportunity to see them twice in México. Long ago, when I worked as a director for a fish/prwns aquaculture company nearby Manzanillo, Colima, where they used to spend the winter season catching on “Tilapia” at the farm, and then in “Punta Mita” Nayarit, where they used to prey on low tides around the península. They were great to watch! What remarkable agility and strength, and what remarkable photography! Thanks for sharing, Candice. Yes, this was an amazing video. Thanks for sharing!!!! I once watched ospreys fishing at the mouth of small stream that had migrating fish (kokanee) in it. The birds would sit lined up in the tree canopy upstream like a line up at a concession stand. The ospreys would go to the fishing spot at the stream mouth in an organized fashion – taking turns one at a time. Each time they caught a fish they did some fancy foot work where they actually let go and re-grab the fish in mid-air so the fishes head was facing forward and its tail facing backwards. I assumed this makes it easier to carry a flopping fish. I must of watched it 5 times before showing my co workers. Is the last fish trout or bass? WOW! Amazing video. Thanks for posting it. Amazing, also, to see the Osprey shake off the water like a wet dog while flying! The video is really special. We’ve watched it several times–so much to see. What a magnificent bird. Long may he fly. Thanks for sharing this.